Welcome to this weeks Blog Showcase. I hope you will join Lori (All That Splatters) and me and cook a recipe found on a fellow blogger's website. 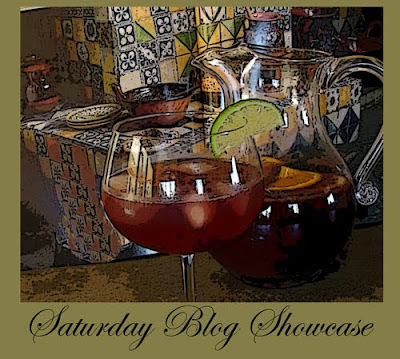 To participate just share the recipe on your blog with a link to the blog where the recipe was found and don't forget to add the Saturday Blog Showcase logo to your post. Link your post to Mister Linky found at the bottom of this page. I was looking for something to bake and stumbled upon a picture of a Texas Sheet Cake. Apparently this cake has been popular for years. Who knew!!! A quick search on Google brought up links to many bloggers who have baked this cake. The picture that most appealed to me was on The Food Librarian's website. This blog was new to me, but I quickly found myself checking out some of her other recipes. If you like baking you will enjoy the Food Librarian. She is all about baking and desserts. Many versions of this cake also call for pecans in the frosting. But I wasn't looking for a cake to taste like brownies so I excluded the nuts. This is a very simple chocolate cake. Nothing fancy, but moist, sweet and delicious. Good thing I gave 2/3's of it away or Moe and I would have eaten the whole thing. I left it covered on the counter and it was difficult to resist cutting off a little square every time I walked by. I baked the cake in a Wilton Cake pan that measures 14" X 11" rather than a 15" X 10" sheet or 13" X 9" cake pan. And as mentioned above, I skipped the pecans. Preheat oven to 350 degrees F. Grease a 15x10x1-inch or a 13x9x2-inch, or a 14" X 11" baking pan; set aside. In a medium bowl, combine flour, sugar, baking soda, and salt; set aside. In a medium saucepan combine water, butter, and cocoa powder. Bring mixture just to boiling, stirring constantly. Remove from heat. Add the cocoa mixture to the flour mixture. Beat with an electric mixer on medium speed until combined. Add the eggs, buttermilk, and vanilla. Beat for 1 minute (batter will be thin). Pour batter into prepared baking pan. Bake about 25 minutes for the 15x10x1-inch pan, about 35 minutes for the 13x9x2-inch pan, or until a wooden toothpick inserted in the center comes out clean. 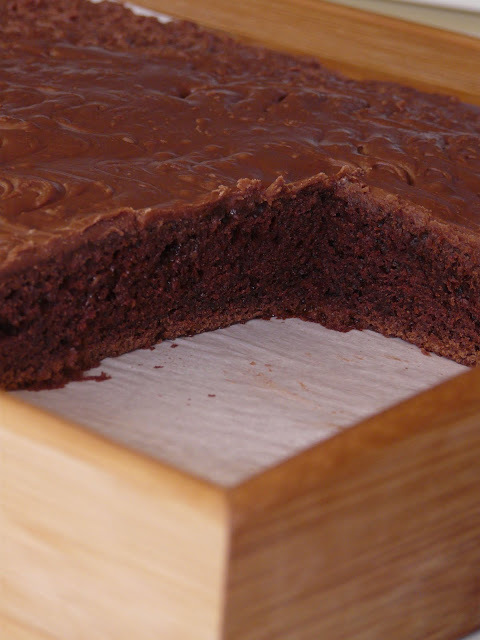 Pour warm Chocolate-Buttermilk Frosting over the warm brownies, spreading evenly. Cool completely in pan on a wire rack. Cut into bars. Makes 24 brownies. In a medium saucepan combine 1/4 cup butter, 3 tablespoons unsweetened cocoa powder, and 3 tablespoons buttermilk or sour milk. Bring mixture to boiling. Remove from heat. Add 2-1/4 cups powdered sugar and 1/2 teaspoon vanilla. Beat with an electric mixer on medium to high speed until smooth. If desired, stir in 3/4 cup coarsely chopped pecans. Note: To make 1 cup sour milk, place 1 tablespoon lemon juice or vinegar in a glass measuring cup. Add enough milk to make 1 cup total liquid; stir. Let mixture stand for 5 minutes before using. 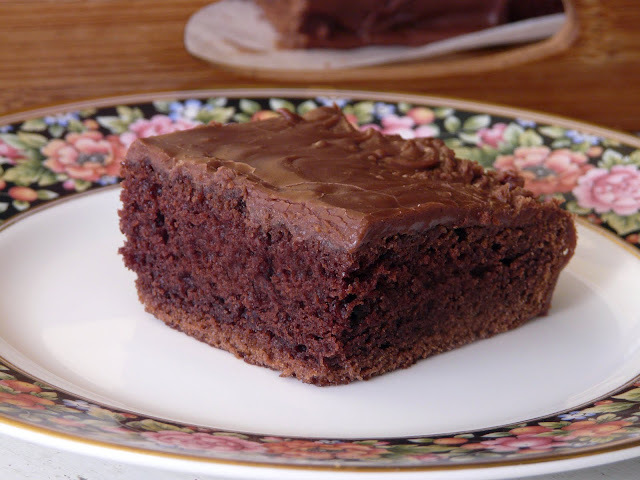 Use 1/2 cup sour milk in the brownies and 3 tablespoons sour milk in the frosting. Discard remaining sour milk. Or reconstitute dry buttermilk by following the directions on the powdered buttermilk container. Hi everyone, I shared a wonderful kumquat almond torta from a local farm's blog. I finally made something in time to participate with all of you. I just discovered this cake a few months ago. My hubby and Allie love it! I'm going to try this one-thanks! I know first hand what a delicious cake this is, Ann. I used to make it YEARS ago, when my DD was little. It was always a hit at the Camp Fire Girl meetings. Even back then, we had to leave out the nuts due to one child's allergy, so I've never made that version. It had a delicious fudge-like quality to it. I think I need to introduce my grandkidlets to it very soon. They'd love it, too, I'm sure. I frost one half cake with the plain icing and the other half with the nuts and coconut added. The grands don't like the nuts and coconut. I think it is one of our favorite cakes along with the classic white sheet cake with Bakery icing. I too have been making this cake since the 70's. It is a favorite. The only difference in my recipe, and I think it takes it over the top, is that I add 1/2 teaspoon cinnamon to the batter. It makes a big difference. Great photos. Easy and chocolate and tested by time...sounds like a winner to me! I like Susan's idea to add cinnamon, too. I just posted Microwave Lemon Curd for Saturday's Bolg Showcase. It was just as easy as La Table de Nana posted. Oh, I have made this so many times. A perfect, easy chocolate cake! This cake has been a much loved favorite in Texas for as long as I can remember (but we usually add the pecans). For years I never went to an after school sports event with my kids, or a grown up weekend event without seeing a couple versions of this cake! So simple yet so good - thanks for sharing! This cake looks like one my grandmother made. She was from Oklahoma, so I bet it has the same heritage. YUM. Thanks for the memories! I've had this cake before but it's been a long time since I've made it. Thanks for the reminder and your beautiful photos!! Robin, welcome, I'm glad you were able to participate this week. Your torte looks delicious. Looks like everyone has tried this recipe or a version of it. I'll definitely make it again. Ann - this cake is a regular feature in our home. I also make a White Texas Sheet Cake and a peanut butter version that my Mom especially enjoys. If you're interested, I'll share those recipes with you. I have never done a Texas sheet cake either; there's only the 2 of us. Love how you cut a little square off each time you pass by. Sounds familiar~like something we'd do here! Pat, I'm not a fan of peanut butter but I would love if you would share your White version. Katy, good thing we had neighbours to share the cake with, otherwise just the two of us would have finished it off ourselves. Looks like I'm late to this party. My sister was prepping for surgery, in all the angst Saturday came and went and I didn't even notice. Your cake looks is just the medicine my sister needs. I think I will make it when she's feeling better! This has always been a favorite of mine. I haven't made it in years though...probably a good thing! I used to make this when the kids went to school. They are all moved away so just DH and I at home.